MaryJanesFarm Farmgirl Connection - Any Spinners out there? Author Gathered Up: Any Spinners out there? I love the idea of covers! And isn't homemade yogurt the best? I use my cockpot and make my own version of greek yogurt. how do you make it in crock pot? Haven't heard of that way to make yogurt. Rejoice always, pray without ceasing, in everything give thanks, for this is the will of God in Christ Jesus for you. Be like a Sunflower, Turn your Face to the Son. Deb, here is the site with the recipe and method. I don't add fruit. I wait and do it when serving. This has never failed me: ) I use organic milk and starter yogurt and after awhile I just use some of the homemade to start the next batch. Thank you will try this this week end. What fun dying my hand spun skein of yarn, with another lady that spin's with me. Here is some a picture of the skein's of yarn I did. Went to a fair last fall and this is what I'm going to try next. Natural dying with bark from the different kinds of trees. So looking forward to seeing the kinds of color. That looks really interesting Deb. How do you collect the bark from the trees without hurting the trees? I really like the natural colors. You take it off your fire wood/or blow downs. Put the bark into a can , fill it with water put it on a open fire. Let it simmer. Then add your skein of yarn and let it simmer until you like the color. It was very interesting to watch and learn. Want to check it out again when I go to fair again this year. They demonstrate at the fair? Wow how neat to watch and learn. So the bark does not have to be off live trees. That is a good thing too. I see some they had tagged as no mordant. Keeps it simple. will have to give it a try sometime. I like the browns. Check out the new Spin-off Magazine the spring one. Its contents is about making dyestock solutions from natural dyes. (about tree bark in it. plus one pot dyeing.) very interesting. Just got mine in mail today. so looking forward to reading it tonight. hope your having a wonderful day. Thanks Deb, I will see if I can find the magazine somewhere. I will look at their website. Did you get the pattern? I finally got my slippers felted. Takes a long time. My sheep wool does not felt quickly. I actually did them twice. Rough guess 3-4 hours of agitating. Not sure if there is something I am doing wrong or just my wool that slow. But they are alot closer after the second felting round. So calling it good enough. I will have to get a picture taken. Deb do you know if they made the bark dye outside cause it smells to do it inside? I wouldn't think bark would smell bad when boiling. You got me thinking now! It didn't seem to smell when they were doing it over an open fire. I know when we dye with powdered packets...they seem to smell alittle in your home.. Will have to try it soon tho. so excited about using the bark to get color. Does anyone have roving to trade for Goat Milk Soap? So enjoy spinning and fiber dying. We will have some Tunis. I have your email, I will contact you sometime this week. Thank you looking forward to hearing from you. I am fairly new to spinning and weaving. I joined our local weaver's guild, Central Ohio Weaver's Guild (COWG), here in the Columbus, Ohio area. The ladies have been great at helping me learn to work on my spinning wheels, and learning to weave on looms. They have atleast three day long retreats during the year where everyone gets together at one of our local state park lodges. Everyone does their own thing fiber related such as spinning on a wheel, drop spindle, weaving, knitting, crocheting, etc. All the attend are very helpful and knowledgeable about a lot of fiber related topics. Our guild also brings in various speakers for classes. We had Judith McKenzie come in and teach a spinning class last Fall, they had another individual come in and teach a weaving class, Abbey Frenquenmont came and taught a class on drop spindle, plus some of our very own guild members have given classes on komihimo and weaving as well. As soon as I can take pictures of my wheels I will post to the thread. Rose let me know if you are close the Columbus area and if you would be interested in attending a guild meeting or I can see if there is a guild close to you that might be able to help you. Also, there is a Cultural Arts Center here in Columbus that periodically gives spinning classes taught by one of our guild members who is a Master Spinner. How nice..that sounds so much fun , the group you have. Looking forward to seeing you wheel. Just love the different syles out there. I'm restoring a flax wheel so looking forward to spinning on this. Have a great day..glad you are learning how to spin, it is very rewarding. One day I would like to take the Master Spinner course. Recently obtained an Ashford Traditional wheel that belonged to a fabulous Aunt of mine who, along with her husband and kids, raised sheep when I was younger. I told her that must have been when the spinning bug latched onto me. LOL There are a couple pieces needing some attention on her wheel since it hasn't been used in a while and I plan on having that wheel back up and running soon. In the meantime, I have a Lendrum and a Blue Bonnet that I can use in addition to my drop spindles. Spinning is addictive and fun to do as I am quicky finding out. I've got a Wee Peggy that I've had since about 1981, and just got a new-to-me, gently used Louet S10 which is supposed to be a beginner's wheel, but I am happy to have. The Rappard Wee Peggy http://users.actrix.co.nz/fbmoknox/comparepeggy/peggycomparison.html is no longer being made. My bobbins are coming apart from the glue going through humidity/drying out cycles. At least the Louet uses standard-sized bobbins so I can get more if needed. Rose in Dover Ohio - you might want to take a look at this list http://fiberarts.org/directories/guilds/Ohio of guilds and see if any are close to you. My hometown (Mansfield) has Malabar farm group, it was very active when I moved away. That might be a little far for you to travel. I think maybe some of the Canton groups might be closer to you? Yes, I love that the lazy kate is built into the wheel. I didn't get a lazy kate with my Louet, I understand one is available to order separately but "backordered" When I look at it, it seems like a lot of money for a little bit of metal. please share with me some of your finished skeins of yarn. Would love to see the colors etc. Hugs have a great Day in the Lord.. I just finished about a pound of my Shetland, going to make some slippers for gifts. 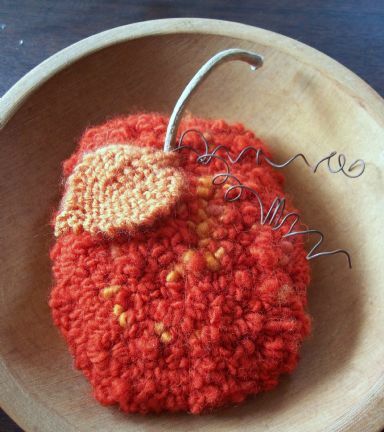 Also had a bit of this yarn that I spun and hooked it into a pumpkin. Not quite the time of year yet for to much spinning, temps. are cooling so time to separate the sheep. "There are black sheep in every flock"
Gathered Up: Any Spinners out there?